Warm hospitality. Enthusiastic service. Unique fresh cuisine. 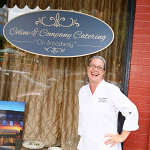 Celine and Company has been a leader in serving Asheville’s finest catering cuisine for more than 20 years. We offer our clients full-service support from the beginning stages of planning through the very end of their special event, creating custom-designed menus and presentation based on the client’s taste, preference and within their budget. However grand your vision or however intimate your gathering, we can help turn your dream into reality! This was a phenomenal venue and everything my fiance, family, and I were looking for! It's nestled right in downtown Asheville, and is easy for everyone to get to and find. Kim and her people were the best to work with and allowed us to truly enjoy planning and experiencing our wedding day! Their expertise and knowledge made planning and executing our event incredibly easy and as stress free as possible. On the day of the wedding, they made everyone feel welcome and took care of us at the same time. We looked up and there were plates of food at our spaces they had prepared, and Kim reminded us to actually eat. =) The food was great and a hit with every guests. They're still talking about it two months later. It was so wonderful working with this excellent group of people. This was by far, the least stressful part of the entire wedding! Chef Kim was an awesome person to work with! She was very responsive to any questions and offered a lot of good suggestions to me. The food was absolutely fantastic and beautifully displayed. I would highly recommend Celine & Company!! We got married in March of 2015 and couldn't have had a better experience working with all of the people at Celine and Company, but especially with Kim. She was phenomenal and was always there to answer a quick question or provide a suggestion. The food was excellent and my guests are still talking about how much they enjoyed it two months later. =) Kim was so thoughtful and comfortable and working with her and her team was the easiest part of the entire planning process. They were so thoughtful and even prepared a plate for us as we were mingling, and a basket of food to take away with us to eat when we finally had a moment hours later. It was an excellent experience! Kim and her team were amazing to work with! From the tasting to the event Kim made my groom and I feel like she was excited about our event and wanted to do everything she could to make sure it was perfect. When we showed up to our venue (offsite) two days before there was no running water and no electricity in the catering kitchen and Kim didn't let it phase her, she made it work. Our menu was catered to us, my groom is a foodie and so loved being able to help in adding special touches. We picked out two signature drinks for the cocktail hour and her team made them exactly like we wanted! We liked being able to determine our own menu, to have it be unique to us and not just have to chose from a prescribed list. On the day of, Kim had her team running super smoothly, she did not interrupt my day once to ask a question which was really important to me. The food was amazing - we got so many compliments - and there was more than plenty of it. She sent us off with a well stocked doggie bag! Kim thought of everything, asked every question she needed to in preparation so that our day could be perfect! I DEFINITELY recommend working with her!